There could be many reasons for a person over fifty might look for a job change, for example, they could have been laid off from their company or simply because they feel the need for change. No matter what the reasons are despite the competitive job market which is filled with youngsters, older job hunters do have the chances to find a new job they will love. It is definitely not that easy and will also take time to find that job but with patience and perseverance, it is not impossible to crack the code. Despite the fact, that the retirement age is close for the older job searchers, the good news is many companies do require people with experience because they have a deep understanding of the market and experience to handle the crisis in a better way. They also bring with the plethora of contacts and network which the employers expect to use it for their benefit. 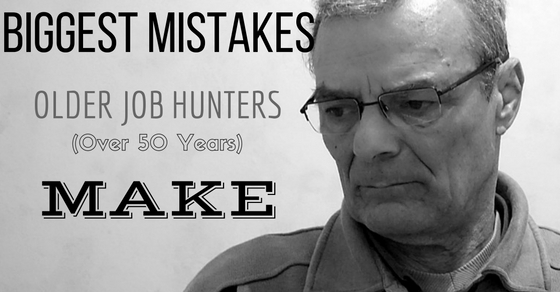 Yet, there are some mistakes which older workers make while looking for a job. The majority of the older job seekers has not shown or designed their resumes over the years, because of which they tend to make boring and irrelevant resumes. Before designing a resume, research about the standard fonts and design which are popular these days. Keep it simple and smart, should be the mantra. With so many years of experience avoid writing everything on the paper and restrict your work to two pages. No recruiter has time to read about everything.The smart thing to do is to write the work which is relevant to the job. Mention your work from past 10-15 years and you need not write about your jobs you did, when you were young. Don’t forget to write about your interests and hobbies as this will show the other fun side of yours. Many older job seekers tend to believe that because of their age no one will hire them. On the bright side this is a false notion, it is true that older workers do face trouble in finding the job they are looking for but companies do seek seasoned employees for the work which requires immense knowledge and patience. Be flexible in your approach while looking for jobs, you might not find what you are looking for but keeping your options open may lead you to various new opportunities. With so much technological advancement from previous years, many new ventures have begun, therefore, try looking for newer options in these newbies companies. Most of the people don’t use their network well enough because they think they might look needy to others. But finding a job through your own personal network is easier since these people know you and your skills, hence, they will recommend you for specific positions. Recommendations work better as employers prefer hiring someone known and connected to their employees. Therefore, use your phonebook and try connecting those who can help you, at least spread the word that you are looking for a job or take advice from them. Sometimes reaching out to people lands up on great opportunities. Probably you are applying for a job which may not be as per your strength, capabilities or it does not pay as per your expectations. It is advisable to take the job if it provides the good opportunity, at this age, money should not be of major concern. Instead of salaries, try negotiating on the perks or medical benefits. If you think a certain company has potential and the designation is not as per your choice, it is still advisable to take the job because work is work, and no job is fixed. With time when the employers realize your skills and strengths, you can suggest to make the changes as per your requirements and your job role can be modified. Everyday across the world new inventions and technology is being developed which has increased the level of learning for the youngsters. If you are looking to make a change in your career then you need to put your brain to good use. It might have been quite long that you learned something new but with so many possibilities you can learn whatever you want, join a class or attend a workshop. Or you can even learn using the benefits of the internet, there are various online tutorials and videos on almost anything and everything available under the sun. Decide what you want to learn what will help you in finding the new job and find the right source of learning. With so many opportunities you never know that you may land up in something unexpected and good. The older generation is yet to understand the importance of digital presence and how your digital footprints can be benefitted. If you do not have LinkedIn, twitter or Facebook account then now is the time to make one and find your old contacts. In fact, almost every company and their employees have the digital presence, the major advantage is that you can connect them and not only learn about the company but can find a job opportunity for yourself. LinkedIn is highly useful to meet professionals and it is like an online resume where you can share your experience in detail. These sites also provide various job opportunities available in the market as per your skills and requirements. The world has totally changed and has become more and more technology dependent. Probably in your previous jobs you might not have used technology much but when looking for a new job, chances are that you need to add to work with digital technology. Therefore, don’t be shy when learning and using it, better to pay attention to the details and learn as much as you can, from the use of computers and smartphones. These are not only handy for job but they will be beneficial for you when looking for a new job. The interviewing strategies have changed over the years and so the development in the companies. The person interviewing you might be quite younger than you or inexperienced. This may lead you to be arrogant and proud, prevent yourself from such behavior. The advice is to respect the other person’s job and proficiency, your focus should be the job and not the other worries. Another concern because it would have been ages ago that you gave an interview, therefore, you might not be prepared for one which may make you nervous. With the benefits of technology, preparing for an interview has become easier than ever, google the points about presentation and interview, prepare yourself beforehand. Your preparation will generate confidence in your body language giving a positive message to the employer. In any job, it is important for a candidate to be a perfect fit in the company. The values, morals, and personality should match with a company. It is advisable to find the job where you think you would be comfortable with the company’s culture. Prevent taking up the job where you know might not be a fit for you because later on, you might regret the decision. Therefore, take your time and research about the company who intend to apply, be choosy and specific as this will help you to prepare for the job interview too. Health and fitness is also vital, if you are not fit then the chances are people might not take you seriously. A good personality always sends a message that you care for yourself and are a responsible person. If you are the kind who do not pay attention to your health, then now is the time to do it because you need a job and you are going to be judged on your personality. Keeping fit does not require immense workout but paying attention to the detail will be sufficient, for example, change your diet, do light exercises or go for a walk. These small steps will bring an immense change in your health and personality. If you are the one who is unemployed then it is better to do something rather than sitting ideal. Probably join an NGO or volunteer for something. Your life experience and knowledge is valuable so you can teach while you are looking for the job. Connect with people meet new people every day, do whatever can keep you up and go. Keeping busy in something or the other is beneficial as this will keep you motivated and when you are going for the interview, you will have something new to share. If you are not getting the call for a long time then pick up the phone and call, follow-up is effective as it will provide you a clear answer or might open up the doors to newer opportunities. You might be laid off or you are stuck in your current career path. Take a break and relax, because stress might lead you to make wrong choices. If you are finding it hard to maintain yourself, then it is good to spend more time with family and meet your friends. There are various support groups, join them and find opportunities to meet new people. Being happy and relaxed while finding the job is of utmost important and it will also keep you healthy. Your family and friends will keep you motivated and prevent you from feeling the pressure to find something new. It is understandable that being out of job hunt scenario, there could be chances of your skills not being effective. Contact a good head hunter or a coach, share your strengths and weaknesses, your achievement and requirements, being out there, these people know and understand what is going on in the industry and what are the requirements. A good headhunter will find the right opportunity for you and train you for the interview too. They will ensure that you are up to date with the current changes happening around and will encourage you to follow them. Initially, you might be hesitant to go for a head hunter or a job coach but these people are a good investment, which will reap benefits later. Standing on the sidelines will not reap the results. The current world is changing fast and everything has become highly competitive. If you are one of them who is scared to get of the comfort zone, then it will be difficult to find the opportunities for you. Therefore, learn as much as you can, bring the changes you know you need to grab those opportunities. You need not bring this change instantaneously, it requires to be gradual, set your goal one at a time and keep pushing your limits slowly. Going out of your comfort zone generates lot of confidence in oneself which will be effective and helpful during interviews. It is true that ageism does happen when one is looking for a job and it is a quite difficult to overcome it. The risk becomes higher in the market which can go unstable at any given point of time, the chances and struggle to standout do get higher. With the right amount of motivation and energy finding the job is not an impossible task. If you do not find the job in your own industry, then try exploring new career options, various new kinds of job profiles have been established with the growth of technology. Put your effort to learn something new and break the rules of doing a boring job. The opportunities are immense and the world needs those who are not bound by their own fears. If you think you are one of those who do not believe in boundaries then success is all yours.